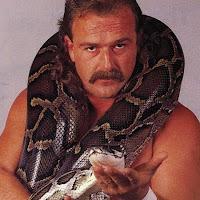 Joe Rogan and WWE Hall of Famer Jake "The Snake" Roberts discussed WWE Chairman Vince McMahon during Jake's appearance on The Joe Rogan Experience podcast this week. Regarding McMahon still being jacked at 73, Jake joked about Vince using growth hormones to maintain the physique. " There's something about growth hormone that continues to work," Jake joked. Jake also praised Vince for his hard work, as many wrestlers and former WWE employees have done over the years. Jake said, "There is nobody on this planet that works as hard as he does." Rogan and Jake then watched a clip of Vince blowing out his quad during the 2005 Royal Rumble pay-per-view. Rogan talked about how big Batista was then and Jake joked that "Vince McMahon's protein diet" had been working for The Animal. Roberts also dropped F-bombs when talking about how he went to work for WWE in the mid-1980s. He said, "That's when Vince hit me with the, 'You're going to be wearing purple or lime green spandex.' Which I said, 'I ain't no f--king f-ggot, I ain't wearing that s--t.'"